Then please submit a ticket over at our support desk. We're here to help! Today is the day. (Yay!) The platform pause is over and you can begin building bots again! See, I was watching the F8 Live Stream when they announced the Bot Pause was over. (Read the full post here BTW). I quickly went to check if things we’re ‘fixed’. To my surprise I found out our App on Facebook needed a resubmission! After talking with multiple other Messenger Developers — and seeing that tons of others were (and still are) facing similar issues — we’ve taken action right away to resubmit our app for approval. And that’s the current status right now… Again, a small hurdle. But one that’s easy to jump. Last review took less than 60 minutes. It also gives us a bit more time to push the new code to the application! As we shared in our Facebook group, Facebook performed this pause in an effort to make sure their platform provides the best experience for all users. Conduct an in-depth review of the platform. Inform people if an app is removed for data misuse. Encourage people to manage the apps they use. Require heightened terms for business-to-business applications. Reward people who find vulnerabilities. In the coming weeks, chatbot builders can be sure to see the results of this dreaded pause, as it will be even more imperative to create bots that truly enhance the customer experience and follow Facebook’s Terms of Service. Which we think is a good thing… Yup. Really. We just wished FB would be more communicative. I mean, after loads of posts in their Developer Groups about this issue we were never given a straight answer. We’ll send out a new post when you can start creating bots again. Yes. Almost there… Just a little while longer. And you will be able to take this baby for a spin. 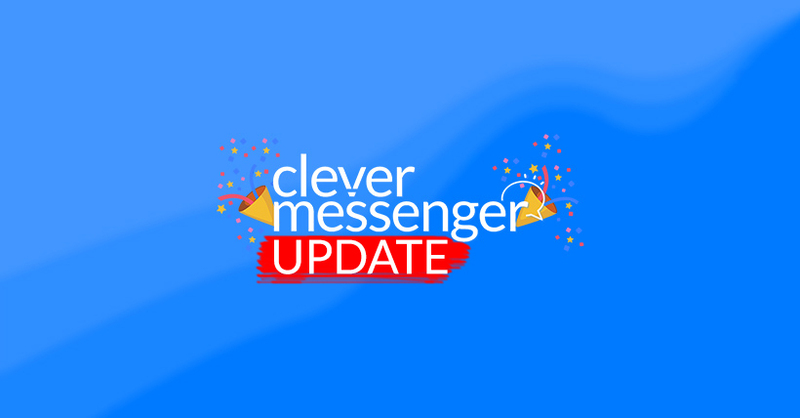 In the next post I’ll give you a quick overview of the latest additions to Clever Messenger as well. We think you’ll love it! Finally! Clever Messenger is Open for Business! Is Clever Messenger GDPR Compliant? Copyright © 2018 • Clever Messenger • All rights reserved.